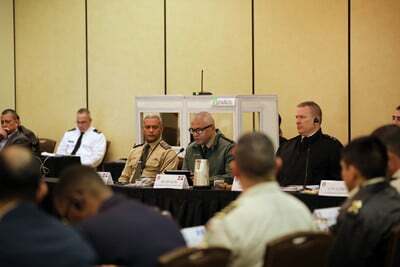 Feb. 8, 2019 — Joint Base San Antonio-Fort Sam Houston, Texas – U.S. Army South hosts the Conference of the American Armies (CAA) – specialized conference on military support to civilian authorities to counter threat networks from Feb. 5-7 in San Antonio, Texas. Pike said the main objective of the conference is to create a CAA guide to countering threat networks. This guide will be based on U.S. doctrine, but the intent is to make it acceptable for all of the partnered nations to improve interoperability by creating common themes and terminology in three languages he said. The guide will be translated into Spanish, Portuguese, and English. Pike said that the team will work on refining the products that come out of the conference and then it will be presented to the Dominican Republic in Aug. where it will be refined and finalized.